A championship football team, an exciting All-America men’s basketball player, a multi-talented All-America women’s basketball player, two dominating football players, and a popular and dedicated UW Athletics administrator and broadcaster comprise the latest class of the University of Wyoming Intercollegiate Athletics Hall of Fame. The Class of 2013 was announced by Hall of Fame chairman Mike Schutte on Saturday at the men’s basketball game vs. UNLV. The dinner and induction ceremony for the Hall of Fame’s 21st class will be held on Friday, Sept. 6th, at the Hilton Garden Inn/UW Convention Center. 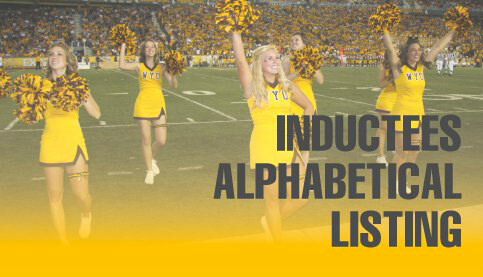 The inductees will also be honored at halftime of the Cowboy football game vs. Idaho on Sept. 7th. This year’s inductees include: Carrie Bacon (women’s basketball, 1999-2003); Josh Davis (men’s basketball, 1999-2002); Jason Gervais (track and field, 1999-2001); Jim House (football, 1966-68); Mike LaHood (football, 1965-67); Kevin McKinney (Administrator/Special Achievement); and the 1959 Football Team. A total of 136 individuals and 15 teams have been inducted into the Hall of Fame since its inception in 1993. Its plaque display is located in the concourse of the Arena-Auditorium. The Hall of Fame Committee met in January to make its final selections for this year’s class. The inductees must fit into one of five categories: student-athlete, coach, team, athletics staff members or special achievement. The special achievement category includes individuals who have contributed to the ideal of sports at the University. Each nominee must receive at least 75 percent of the committee’s vote to be eligible for induction. Nominations are encouraged and are due in to the committee by Sept. 1st in order to be considered for the following year’s class.